These were the words I saw on the back of a reed diffuser box at the store. "Warning: This reed diffuser oil is fatal if swallowed." Yikes! That is not the kind of thing I would want around pets or kids. 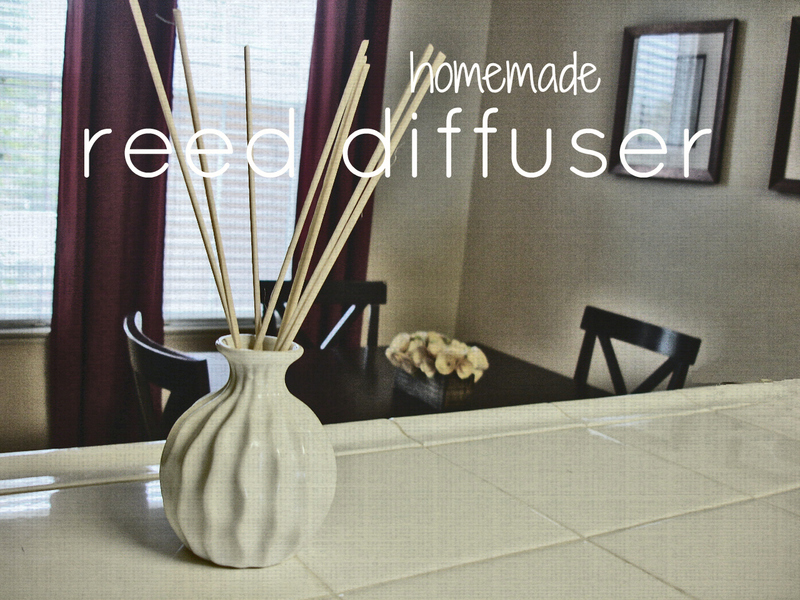 So I've been running some, ahem, extremely scientific experiments to find what makes the best all-natural DIY reed diffuser. Prepare to have your mind blown. Okay, not really but that was really fun to say. Many reed diffuser recipes call for mostly oil. But oil was a disaster. It was way too heavy to travel up the reeds and the scent was minimal. Water worked much better. Tap water seemed to work just as well as distilled/filtered water. Essential oils were the perfect choice for the scent. 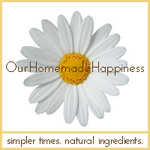 Unlike fragrance oils, essential oils are natural compounds extracted from parts of plants, flowers, and trees. 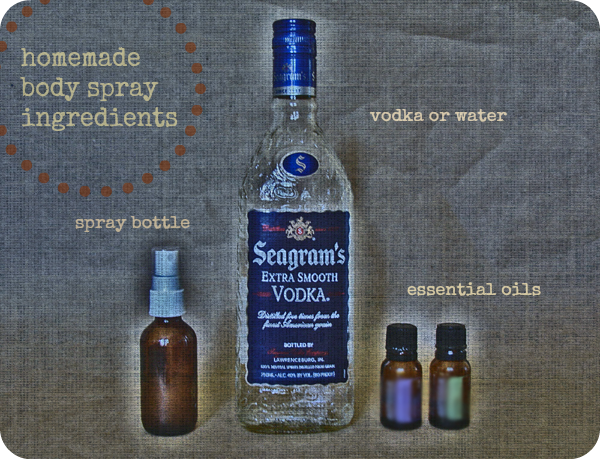 Adding a splash of rubbing alcohol or vodka helped the essential oils distribute more evenly into the water, but the water traveled up the reeds better without it. So here's the recipe I came up with. 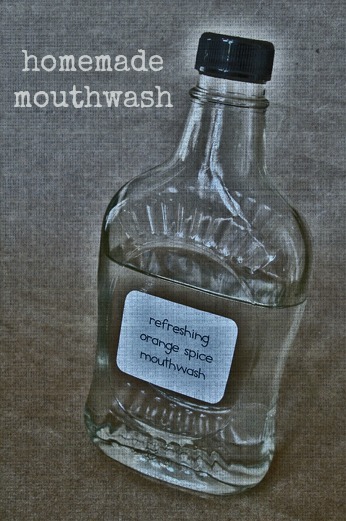 It's simple, natural, and inexpensive, my three favorite words. A vase or bottle with a narrow neck is best to help prevent the water from evaporating into the air. 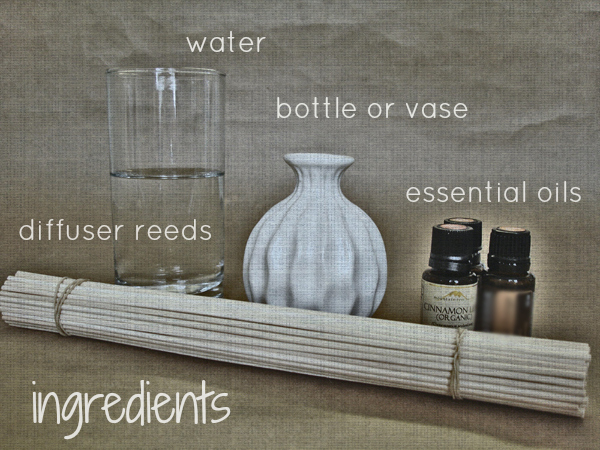 I used reed diffuser sticks, but I've read that bamboo skewers also work. The reeds should be about double the length of the vase so you may need to cut them with wire cutters. 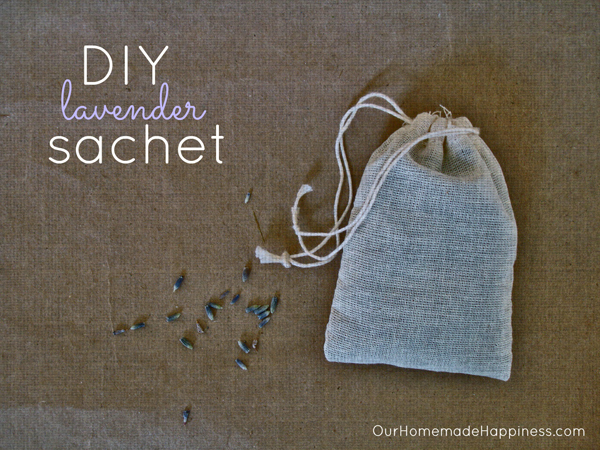 Add water and essential oils to the vase. 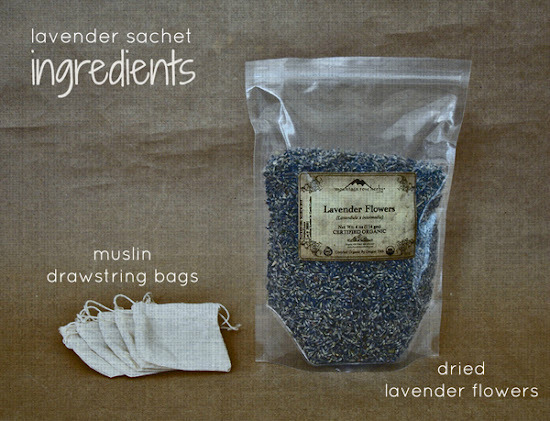 You can find essential oils at your local health food store, Amazon or Mountain Rose Herbs. Stir vigorously with the reeds. Be patient and give the scented water a chance to travel up the reeds. Rotate the ends of the reeds every so often. To see more ways to freshen a room naturally, check out my blog post Natural Air Freshener Ideas that Heal, Not Hurt. 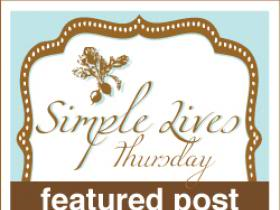 If you want to learn more ways to use essential oils, check out these blog posts. 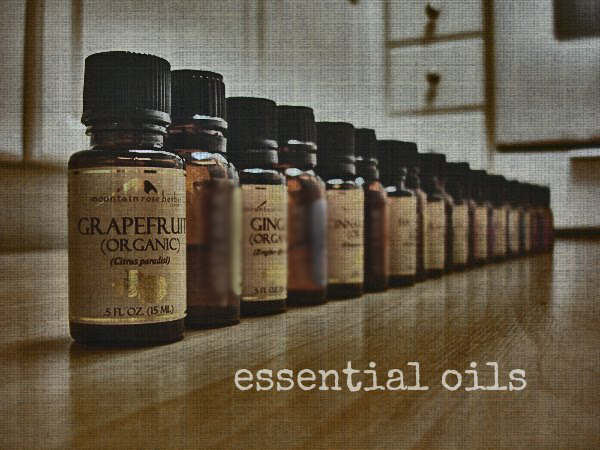 What essential oils do you like to use for freshening a room? 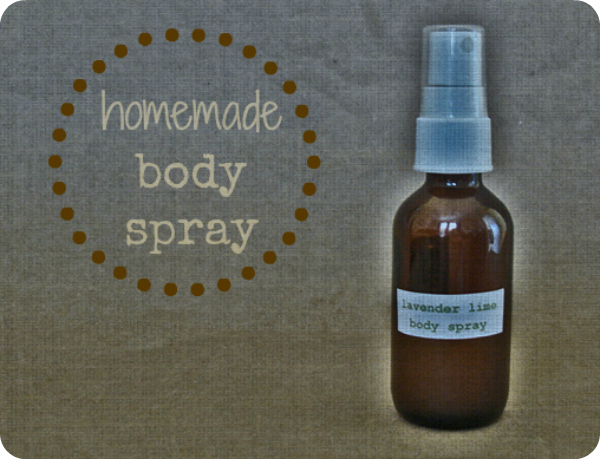 I LOVE making homemade products, but let's face it. There are some things I just can't make, don't want to, or haven't gotten around to making yet. 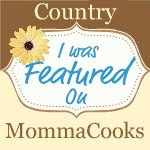 I'm a busy mom with young kids! So here are some of my favorite store-bought products that I currently use. I chose these products carefully after spending way too much time comparing ingredient lists at my local health food stores. The store employees thought I was a weirdo. 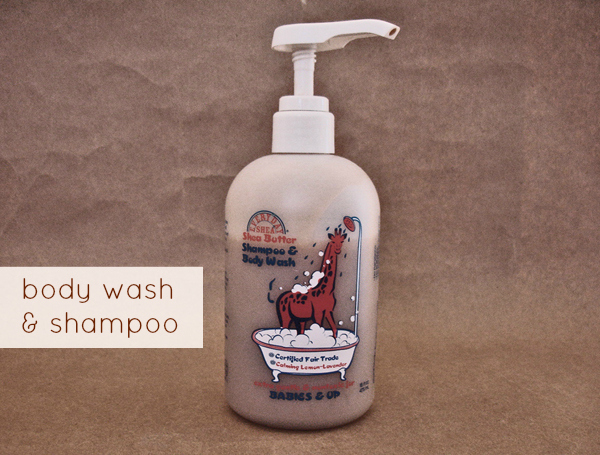 for Babies & UpThis shampoo/body wash contains the most natural ingredient list I could find. It's so simple and it contains a very gentle surfactant. It smells like lavender, which isn't my favorite scent, but I can live with it. I have dandruff so I haven't used it on my hair, but I shampoo my kids' hair with it and my husband uses it. I use it as a body wash and to shave my legs. That way I don't have to buy another product (shaving cream) to clutter my shower. I buy it from my health food store or Amazon, depending on which price is better at the time. 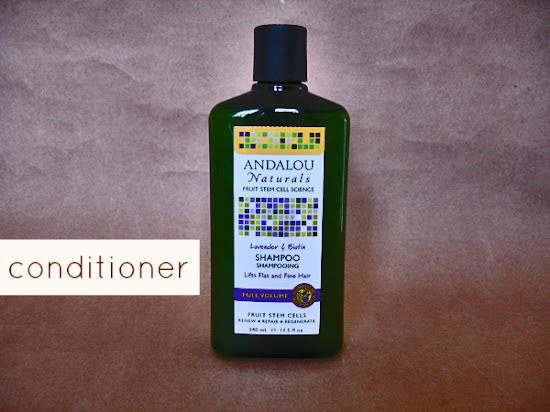 ConditionerI don't use conditioner every day because my hair is so fine and it's usually not dry. But when I need it, this is the conditioner I use. (I just noticed my picture is shampoo, not conditioner. Oops!) I really love the Sunflower & Citrus scented conditioner. It smells great, it doesn't weigh my hair down, and the ingredient list looks more natural than others I compared it to. 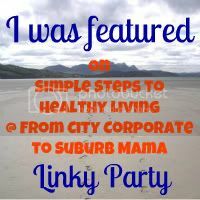 You should be able to find it at your health food store or Amazon. SunscreenIt's expensive, but I don't mind paying extra for a safe sunscreen. It takes more effort to blend in to get rid of the white hue, but I don't mind. It's whiter than regular sunscreens because it uses zinc oxide (a mineral) instead of toxic chemicals like oxybenzone. I buy this sunscreen from my health food store or Amazon. 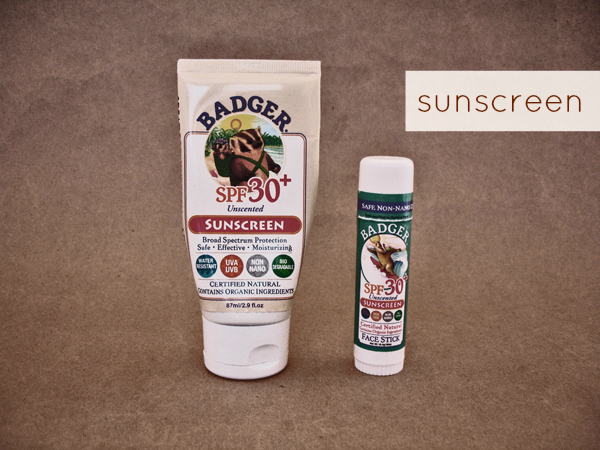 For more safe sunscreen options, check out Environmental Working Group's Sunscreen Guide. 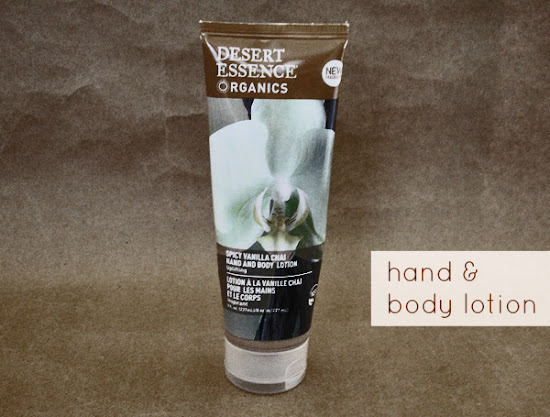 Hand & Body Lotion Usually I use coconut oil for lotion, but sometimes I don't have patience to let it soak in so that it's not greasy. And my husband refuses to slather coconut oil on his body so I need a lotion to have on hand. 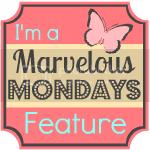 My favorite scent is spicy vanilla chai, but I've also liked the other scents I've tried. I can find this lotion at my health food store or Amazon. 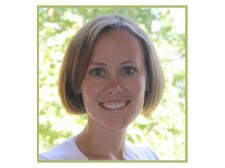 Children's Fluoride-Free ToothpasteMy kids still swallow their toothpaste. They haven't gotten the hang of rinsing and spitting yet. I'm not going to let them swallow fluoride every night and morning AND drink it in the water supply. I don't want them to get dental fluorosis. So that's why I chose a fluoride-free toothpaste. 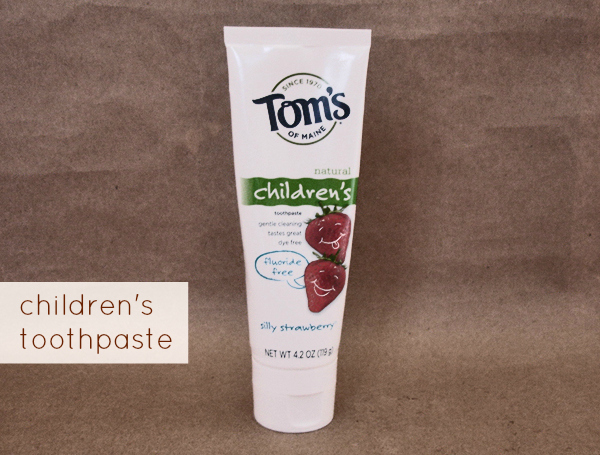 You should be able to find this children's toothpaste at a health food store or Amazon. 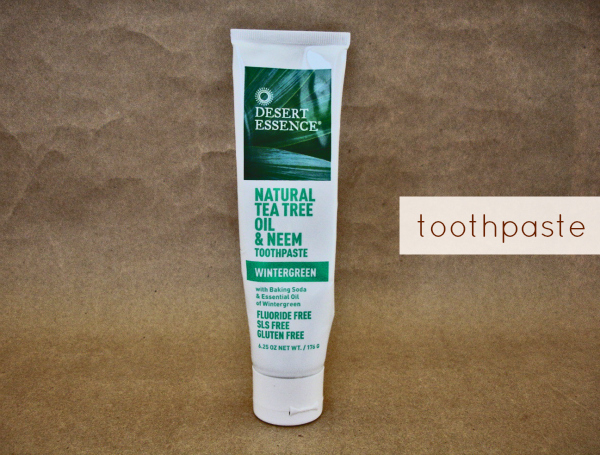 Tea Tree Oil & Neem Toothpaste Desert Essence toothpastes have a very simple, natural ingredient list so I went with that brand. Neem oil is very good for your teeth and tea tree oil is disinfecting. When I first started using this toothpaste, I noticed my teeth looked whiter although it doesn't advertise that it whitens. You should be able to find this toothpaste at a health food store or Amazon. and Dr. Hauschka Make-UpThese are the brands of make-up my Sprouts and Whole Foods store sells. Dr. Hauschka's is more expensive so I usually go with Zuzu or Mineral Fusion. 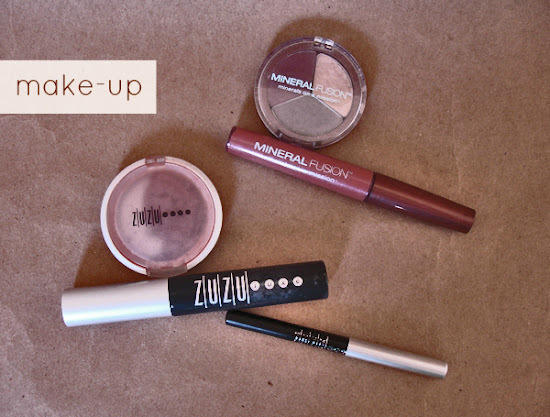 Mineral Fusion mascara was clumpy, so I prefer Zuzu mascara. I'm happy with the Zuzu eyeliner pencil. I chose Mineral Fusion eyeshadow because I like how it comes with three colors in one container. The only problem I've noticed with the Zuzu blush and Mineral Fusion eye shadow is, it breaks easily so be careful not to drop it (can you see my broken blush in the pic?). I really love Dr. Hauschka's liquid concealer pen. It goes on smoothly and blends in easily. I like the Mineral Fusion lip gloss, but wish it was shinier. Has anyone tried 100% Pure Cosmetics? I'm dying to try their brand because their ingredients are a lot more natural and simple than even the "natural" make-up brands I'm currently using. I'd love to hear about your experience with it if you've tried it. 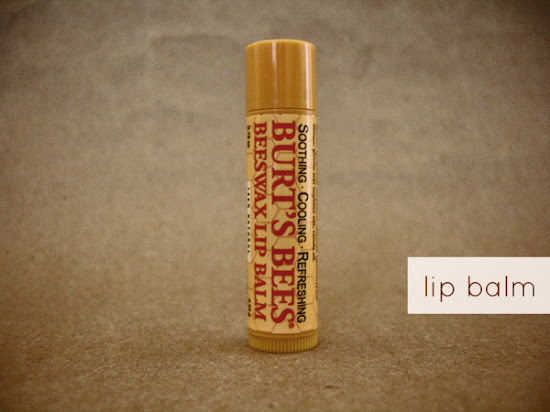 Beeswax Lip BalmI usually use oil and shea butter on my lips, but sometimes I need something faster. I'm sure most people are familiar with this lip balm. You can find it almost anywhere (even Amazon), which makes me happy! I love the cool peppermint flavor and smooth texture. Now it's your turn! 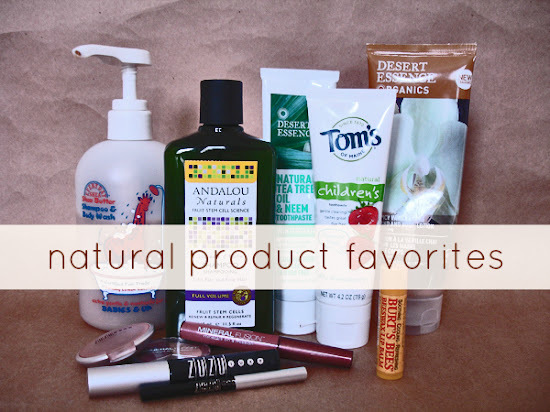 What are your favorite natural products?